The wearable tech market, whilst still in its infancy, has quickly become a significant global industry, whilst the developments in data analytics software continue to transform the landscape of sport at all levels. But as the innovation continues, so too will the challenges facing clubs, governing bodies, federations, athletes, sponsors, sports technology professionals, agents lawyers, and sport's other stakeholders. This article examines some of the data privacy and other legal issues arising out of recent developments, and ultimately assesses where and how the law will be applied to the challenges posed by sport's digital revolution. 22 December 2014. The day that FIFA finally killed third party ownership. Three months earlier, at its meeting on 25 and 26 September 2014, the FIFA Executive Committee passed a decision of general principle outlining its plan to ban the ownership of player’s economic rights by third parties (“TPO”). In the period since, a dedicated working group laboured to draft technical regulations to implement the ban. On 18 and 19 December, the FIFA Executive Committee approved new provisions to be included in the Regulations on the Status and Transfer of Players. TPO has been a hot and evocative topic for some time. It is now almost nine years since Carlos Tevez and Javier Mascherano brought their South American flair to the Premier League - leading tothe much publicised dispute when they helped to keep West Ham in the Premier League and the subsequent knee jerk ban on TPO by the Premier League and the English FA. There were many exciting legal and regulatory developments in sport in 2014 (see Key sports law cases of 2014). In this article the LawInSport Advisory and Editorial Board Members provide an expert opinion of the key sports law cases and developments to watch in 2015. "Want to be an agent? Open your mouth and declare yourself one: you don’t need a lawdegree, you don’t need an education, you don’t have to have a licence – knowledge of sport is preferable but not mandatory." The brand valuation of a football club forms a significant part of its total value. For instance, Bayern Munich, Arsenal and Manchester United alone have a combined brand valuation in excess of £550 million. Given the rise in use of Twitter by fans and footballers alike, tweets have the potential to affect how clubs are perceived, which in turn impacts their brand value as well as the reputation of the sport. This makes tweeting a major concern, especially when barely a week goes by without a footballer tweeting out a comment that lands them in hot water. It also raises the issue of how clubs and governing bodies appropriately regulate footballers’ use of Twitter and, indeed, ultimately how controversial tweets can affect the player-club employment relationship. This author would like to share his thoughts on this latter issue following the recent first domestic appeal-level decision about workplace social media misconduct, Game Retail Limited v. Laws, in which he acted for the successful Respondent employer. Continuing reading article: Shergul Arshad is the former Head of Digital at AS Roma and recently launched a new company called Mondogoal, which capitalises on the growing daily fantasy sports market by focusing exclusively on soccer, the world’s most popular sport. In the six months since the company launched, Mondogoal has already formed partnerships with Barcelona, Liverpool, Manchester City, West Ham United, and AS Roma. It has also been nominated for the “Rookie of the Year” award by the Fantasy Sports Trade Association (FTSA). Jake Cohen spoke with Mr. Arshad, who provided LawInSport with an industry perspective on the burgeoning daily fantasy sports market. He also discussed some of the key legal issues involved in gaming licensing and sponsorship across multiple jurisdictions, with a particular focus on differences between the United States and United Kingdom. The implementation of FIFA’s Regulations on Working with Intermediaries (the “FIFA Regulations”) on 1 April 2015 signals the biggest transformation of player and club representation in the history of professional football. The Football Association (“The FA”) has become the first national association worldwide to publish its supplemental regulations and, in this article, Dan Lowen (founder of www.footballintermediary.co.uk - a website dedicated to explaining the new regulatory regime) will examine the FA Regulations on Working with Intermediaries. 27 May 2015: a date that will now live in infamy for those in the footballing world. Following what appears to be a lengthy investigation, the US Department of Justice announced that nine FIFA Officials and five executives from sports marketing and broadcasting corporates have been indicted on charges for offences that include racketeering, wire fraud, and money laundering conspiracies in relation to the corrupt allocation of media, marketing and sponsorship rights for football (soccer) tournaments. Seven of the FIFA officials were arrested in Switzerland by the Swiss authorities in the early hours of 27 May and detained pending extradition to the United States and simultaneously a search warrant was executed at the headquarters of CONCACAF in Miami, Florida. If all of that was not enough for the global football community, the Swiss authorities announced that they too had opened a separate set of criminal proceedings against individuals on suspicion of mismanagement and money laundering relating to the award of rights to host the 2018 and 2022 FIFA World Cups in Russia and Qatar. Financial Fair Play and the Striani ComplainTwitter: Where are we now? Since the publication of the two-part article ‘Fair or Foul? Competition Law and the Financial Regulation of Football’, there have been a number of significant developments in the field of financial fair play (FFP). As anticipated, UEFA’s new regulatory regime was not happily received in all quarters; it has been (and remains) the subject of various legal challenges and complaints (some of which are outlined below). The European Commission (“EC”) has so far declined to initiate a detailed investigation into the new FFP regime, and it appears that any legal challenge is likely to bypass the EC and head straight to the courtroom. Indeed, 26 February 2015 is a historic day for sport and the law not only because it is the day of the inaugural LawInSport conference, but also because it is due to be day one of a two-day hearing in the Belgian Court of First Instance, at which the lawfulness of the UEFA FFP Regulations will be considered. The Football Association (“The FA”) Chairman, Greg Dyke, recently announced two important developments during an update on the England Commission (aimed at improving the English senior team)1 that could have a significant impact for both young English players and non-EU players looking to play at the highest echelons of the game in the UK. Firstly, following months of FA led discussions, Mr Dyke announced that the Home Office have approved a fundamental reform of the work permit system that will come into effect from 1 May 2015, in time for next season. Mr Dyke states that this change was implemented with a view of ensuring that only the best non-EU foreign players will be granted permission to play in England with less “bog standard” foreign players taking spots of local young players who would otherwise receive playing opportunities. Secondly, Mr Dyke announced proposals to change the home grown rules by changing the definition of a ‘home grown’ player in an attempt to improve the flow of young English players from academies to the highest level. The FIFA World Cup was one of the sports highlights of 2014. Off the field, however, it has been an annus horribilis for football’s world governing body. FIFA has been dogged throughout by controversy relating to the award of the 2018 and 2022 World Cups to Russia and Qatar. As the year ends, that controversy has further morphed into farce. On 5 September, FIFA’s independent ethics investigator, Michael Garcia, presented the organisation with a detailed 430-page report on the bidding process for the 2018 and 2022 Cups. FIFA declined to publish it in full but a week later its ethics “judge”, Hans-Joachim Eckert, released a 42-page summary of the Garcia report. In a series of Kafkaesque twists, an internal complaint by Garcia – in essence, an appeal by Garcia against the misrepresentation of his own report – was dismissed as “inadmissible” by FIFA’s appeals committee, prompting Garcia’s resignation. The same appeals committee that dismissed Garcia’s complaint also dismissed claims by two whistleblowers that the Eckert summary had breached the condition of anonymity under which they had agreed to cooperate with Garcia and give him intelligence on alleged corruption in both bidding processes. Both of the whistleblowers claimed that, although the Eckert summary had not named them and some redactions had taken place, a clear inference could still be made as to their identity to the extent that one of the whistleblowers even claimed that her life was in danger. In December 2014, the UK Government released its cross-government Anti-Corruption Plan. The Plan brings together, for the first time, all of the UK’s activity against corruption in one place. The Plan is intended to apply to many sectors in society – including sport, which has its own dedicated section – and its strategic response to corruption will follow four P’s: Pursue, Prevent, Protect and Prepare. This blog will critique the Plan as it relates to sport in light of both the recently proposed legislative and regulatory amendments to the current anti-corruption framework and the criminal match-fixing cases investigated in England and Wales in the past couple of years. The history books are set to be re-written as The Seattle Seahawks take on the New England Patriots on the biggest of stages at Super Bowl XLIX in attempt to break the much feared Super Bowl repeat curse which has plagued NFL teams for the past decade. Although the pinnacle of the 2014/15 season is almost here, with the benefit of hindsight, it won't be this spectacle however which leaves the lasting legacy. The reasoning for this is that on reflection, the 2014/15 season may in time prove to be an incredibly important year for the expansion of the NFL. The Dallas Cowboys win at Wembley Stadium brought down the curtain on the 2014 NFL International Series where a record three games were played in the UK. Although this marked the end of the International Series for another year, whether the sell-out crowd at Wembley realised it or not, it is quite possible that what they were actually witnessing was the start of something much bigger - a permanent NFL team in London. Momentum has gradually been gathering for the NFL to introduce a London based franchise, and if the success of the 2014 International Series is anything to go by, this movement may just have reached a critical mass. This article will therefore seek to analyse the arguments surrounding the viability of a London franchise, highlighting the key legal considerations that would need to be addressed in order to make the London franchise possible. The legal implications of an NFL team calling London home are huge, and a plethora of legal considerations will require addressing. Part 1 of this article will explore one particularly important issue: how a London franchise would interact with UK tax law. Part 2 will explore the wider legal considerations a London franchise would need to take account of. Part 1 of this article set out the basis upon which a London franchise may be set up, with a focus on the tax implications of a NFL team based in London. However, in order to determine the true feasibility of a London franchise, the broader legal considerations will need to be addressed. Part 2 of this article will therefore explore the wider legal areas that will require careful analysis before we see the NFL make the leap from ad hoc visitors to calling London home. For Manchester City FC (“Man City”), it has been a somewhat interesting start to 2015 off the field. In the wake of the contractual confusion over the registration of Frank Lampard, and the blockbuster signing of Wilfried Bony on the 14th January 2015,1 for a reported fee of up to £28m from Swansea, the club’s administration is under the microscope again. In parallel with the transfer dealings referred to above, reports have also surfaced of Man City’s arrangements with two loss-making companies that share the same parent company as the football club (City Football Group Limited). Below the author will explore the detail of these reports and focus on whether the club’s critics are correct to raise suspicions with regard to the club’s compliance with the UEFA Financial Fair Play Regulations (“FFP Regulations”). A decision towards the end of last year by the Competition Appeal Tribunal (CAT) to expand the scope of the must offer obligations to ensure BT YouView customers get access to Sky Sports 1 and 2 appears to have given some of the initiative to BT.2 However, as explained below, the battle is far from over and the next 12 months are likely to bring further twists and turns on various different fronts. How do you calculate the market potential for a sports domain such as .CRICKET, .FOOTBALL, .RUGBY, .BASKETBALL, etc? According to one of the operators of these newly launched generic top level domains (gTLDs) calculating the market potential for sports gTLDs is never easy and can be very subjective. One of the main reasons for this is that ‘passion’ is an integral part of the equation and, in sports, passion can far outweigh normal common or business sense. Nevertheless .CRICKET, for example, is being marketed as “the new top level domain for 2 billion fans”. Of course targeting fans is one thing but how do established brands and organisations operating within the cricketing world apply common or business sense to make a decision as to whether to participate in this new gTLD and also secondly as to how to protect their interests against outside threats in what could become the go-to place online for all things cricket related? Recently I was fortunate enough to be in Abu Dhabi to see my fellow countryman Lewis Hamilton win his second Formula 1 Racing (“F1”) Drivers World Championship title. However, at a circuit where the world of F1 is at its most glamorous a metaphorical dark cloud continued to hang over the paddock. Despite often objectively being viewed as a financially rich and successful global sports brand, towards the end of the season, F1 has been beset by financial turmoil and in-fighting between the teams. During the Abu Dhabi GP this took a new twist when it was revealed that the European Union (“EU”) were being lobbied to launch a competition enquiry into the sport and how it is governed by Anneliese Dodds, Member of the European Parliament for the South East England, a region which is home to a number of businesses involved in F1. Given the EU’s previous intervention in FIA Formula One World Championship (Championship), it would be understandable for the F1 racing and the FIA to take these concerns seriously. This blog will examine the history of the EU’s involvement in what is arguably the world’s most popular motorsport and the legal impact an investigation could have on F1’s financial future and governance. The subjective nature of judging professional boxing bouts has resulted in many disputed decisions leading to accusations of judging incompetence and corruption. This article will explain how professional boxing’s most popular scoring system works, before analysing the perceived benefits and weakness of the system with reference to some “bad” decisions. Finally, consideration will be given as to how the system could be improved to ensure greater accuracy and efficiency in outcomes. In promoting the success of a sports club, attention will inevitably be drawn towards improving the club’s player base and coaching staff, managing its financial and administrative affairs and securing proper premises and facilities. This is rightly so, but often overlooked is the way in which the club is set up legally and the impact that this may have on the financial and legal position of the club, and the personal risk which committee members and trustees take on. This can be of critical importance, particularly if there are financial difficulties or a claim brought against the club (for example for player or spectator injury). This guide looks at the different legal structures available to sports clubs, ranging from members’ associations to corporate bodies, and considers the advantages and disadvantages of each. If you are involved in running a club, it is prudent to consider whether your club is set up correctly. This guide aims to help you with this. 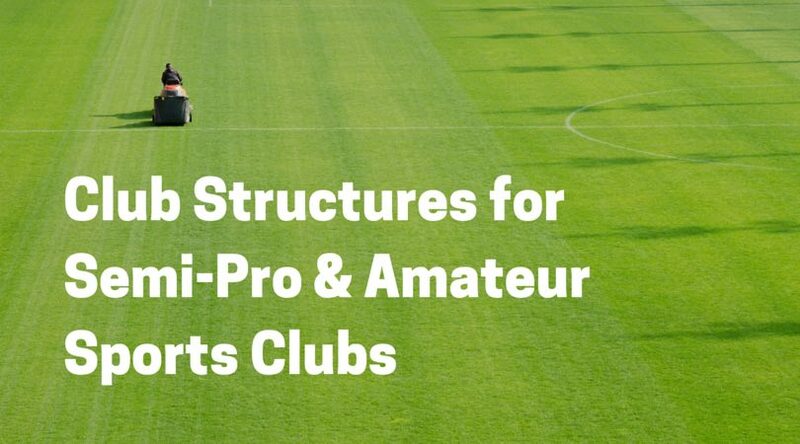 The Appendix to this guide sets out an overview of the process of adopting a new structure for your club. When we seek to identify trends in the sports sponsorship market for 2015 and beyond, two stand out to us above all others: the continued, and seemingly inexorable, growth of revenues derived from the market; and the utilisation of technology and data by brands to target a new generation of tech-savvy consumers. Not much needs to be said from a legal perspective about the first of these trends: the numbers speak for themselves. The World Cup in Brazil generated $1.4 billion from sponsorship deals with 20 major companies, a 10 per cent increase from the 2010 World Cup. Global estimates place revenues from sports sponsorship rising to beyond $45 billion by 2016, with a recent example being Chelsea’s new shirt deal with the Yokohama Rubber Company, estimated at $60 million per season over five years (more than double the amount paid by its current shirt sponsor Samsung). It is the latter trend and the way in which brands are proving smarter and more innovative in how they use technology and information to target consumers in their sponsorship activation that poses some interesting questions. As Albie Hecht, former Nickelodeon President and CEO of TV station HLN, puts iTwitter: “to capture an audience you have to capture the way they behave”. The means of doing so, and delivering the ability to do so, are in evolution, creating challenges for sponsors and rights holders alike in terms of how this goal can be achieved and what can legitimately be done in its pursuit. The author’s previous article (available here) examined the terms of the current dispute between the Football Federation of Australia (FFA) and the Professional Footballers Australia (PFA) over the game’s new collective bargaining agreement (CBA). This article moves on to consider whether the FFA’s new salary cap proposals (one of the core issues of the dispute) could constitute an unlawful restraint of trade. The author gives a short overview of leading cases in common law restraint of trade in sports, and then analyses how the doctrine may be applied to the current dispute should there be a legal challenge. Brands are critical for creating business value, and the sports business is no exception. Strong brands command customer loyalty and premium prices, constituting valuable assets that drive company revenue and growth. They are central to many sports business transactions, especially sponsorship deals and product merchandising. And at the heart of branding lie trademarks. One interesting point to highlight from the World Intellectual Property Organisation (WIPO) note on the interaction between Sport and Branding is the notion that trade marks “represent, if successful, a promise kept”. If unsuccessful therefore it serves to follow that a customer experiences a promise broken which is rarely perceived as a positive attribute. When applied to trademarks that broken promise is most likely to manifest itself in the form of defective or counterfeit goods. If goods bearing a trademark are not genuine, ie. they do not adhere to the brand values associated with that promise they arguably not only undermine the capability of the trade mark to function as a trade mark but can also damage the reputation of the brand owner in question. If trade marks act as a guarantee of origin and embody a set of brand values that for example might denote characteristics such as high quality or technological superiority, conversely, counterfeit goods represent the opposite end of the spectrum. They are the broken promise of a trademark and associated brand values. Earlier this month, The Football League’s Professional Conduct Committee (“the Committee”) issued its decision in the appeal made by Leeds United owner, Massimo Cellino, against his disqualification under The Football League’s owners’ and directors’ test set out in Appendix 3 of its Regulations and Rules (the “Regulations”). The case involved complex and technical arguments concerning the various elements under the test that need to be proven in order to lead to a disqualification. It is interesting to note from the decision how the Committee addressed these arguments with an eye on how future cases may be determined.